As online learning continues to grow across Michigan, becoming a popular option for families seeking greater flexibility and individualized student attention, one statewide virtual school is expanding its service offerings for the 2016-17 school year to include grades 6 through 8. Great Lakes Cyber Academy (GLCA) today announced that enrollment for grades 6 through 8 has opened, as well as enrollment for its existing grades 9 through 12. GLCA, a tuition–free virtual public school option available for students throughout Michigan, opened to high school students in 2013. Given the ongoing demand for online learning in the state, GLCA will now offer its award-winning curriculum and personalized attention from Michigan-certified teachers to middle schoolers from Monroe to Marquette. The introduction of a middle school program will enable students and families interested in attending GLCA to make the switch earlier. For the 2016-17 school year, enrollment for grades 6-12 is limited to 1,100 students. Students in grades 6-8 will attend school during a traditional 10-month school calendar, while the school’s high school program will continue to offer three flexible graduation pacing options. High school students can choose to learn in two or three sessions—fall, spring, and summer—allowing for students to decide how many courses to take throughout the year to meet their learning style and needs. Virtual education appeals to all types of students, and families are choosing online learning for a variety of reasons. According to a 2015 third-party survey of parents of online students, the top reasons for choosing virtual school include the desire for a more flexible schedule, wanting a change in the learning environment from their current school situation and wanting a safe learning environment. Learn more in the Infographic: Growth of K-12 Online Education. In the months ahead, GLCA will host information sessions in-person and online. Such sessions allow families to get a feel for what to expect and what’s involved in online education so they can determine if it is the best fit for their student. At information sessions, parents will have an opportunity to learn about the curriculum, as well as thoroughly explore the school program and interact with faculty and other parents. For more information about full-time online school, information sessions and enrollment eligibility, please visit http://www.GreatLakesCyberAcademy.com/Events. Great Lakes Cyber Academy (GLCA) is a tuition-free statewide online charter school serving students in grades 9-12 from across Michigan, and will expand to serve grades 6-8 in the 2016-17 school year. The combination of Michigan-certified teachers, a proven curriculum, engaging electives, technology tools, and community experiences creates a supportive and successful online learning opportunity for families and students who want an individualized approach to education. 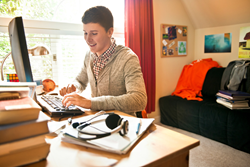 The unique virtual high school offers students in grades 9-12 greater flexibility through a variety of pacing options including a traditional school year option, a year-long school year option and an accelerated option. The school is authorized by The Governor John Engler Center for Charter Schools at Central Michigan University. Great Lakes Cyber Academy’s online school program is provided by Connections Education, a leading provider of online and blended learning and accredited by AdvancED. For more information, call 855-GO4-GLCA (855-464-4522) or visit http://www.GreatLakesCyberAcademy.com.